I have an app with lots of iOS Switches and the customer wants to something else than the standard green when some switches are ON. Changing TintColor doesn’t work: affect the border color when switch is OFF and has no effect when switch ON. Has anyone a solution to change this green color ? Cherry on the cake would be to be able to specify a color for OFF state and another for ON. 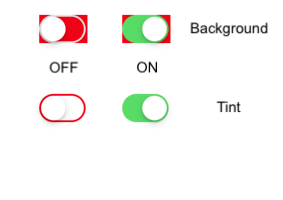 You might wanna try iosdesignextentions as it should have the "ontintcolor" property for switches. you need the complete class/module to have UIColor and such but this is how it works. you need the property "onTintColor" (when on) instead of "TintColor" (when off) you might still wanna use the declares as there is no alternative. @Olivier C — Apparently, you need to set the "cornerRadius" to remove the unwanted corners. Thanks for these ideas, I’ll check later today and let you know ! tintColor is the outside border when "OFF"
@Dave S — True but the cornerRadius is useful if you want to change the background color because the background is a rectangle by default. At least that is what I understood from the article I linked. I am no specialist. @Stéphane ;Mons @Dave S — True but the cornerRadius is useful if you want to change the background color because the background is a rectangle by default. At least that is what I understood from the article I linked. I am no specialist. @Dave Sisemore — I agree with you. Thanks to all, Jeremie extensions are perfect for ON Tint color.